This post is part of a symposium on Ayça Çubukçu’s book For the Love of Humanity: The World Tribunal on Iraq (University of Pennsylvania Press, 2018). All contributions to the symposium can be found here. 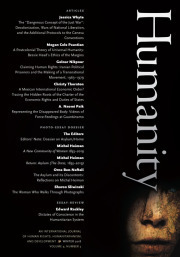 I would like thank the remarkable scholars gathered in this book symposium from the fields of anthropology, history, international law, international relations, and English literature, who have responded in challenging ways to my book, For the Love of Humanity: The World Tribunal on Iraq, and to what the book describes, analyses, questions, and proposes. If, as Lori Allen suggests, the book “troubles both academic genres and political assumptions,” so do the valuable reflections collected in this symposium. They respond to the praxis of the World Tribunal on Iraq—its foundations, motivations, implications, limitations, provocations—as well as (and at times more than) my analysis of that praxis and its legal and political context. While the book, in Gary Wilder’s words, “engages deeply with the challenge of solidarity politics and anti-imperial internationalism under current geopolitical conditions,” the scholars in this symposium partake in this engagement by posing difficult questions of their own, and at times answers, about the proper means, ethics, and politics of enacting anti-imperialism and internationalist solidarity today. I am grateful for the intellectual and political comradery they have offered in this way. Tor Krever responds to the book by contrasting the World Tribunal on Iraq (WTI) with its historical inspiration and antecedent, the Russell Tribunal on Vietnam, convened by Bertrand Russell and Jean Paul Sartre in the late 1960s. He perceptively observes that whereas the Russell Tribunal “was the creation of a handful of prominent intellectuals,” the WTI was “an altogether different creature, the product, as Ayça Çubukçu shows in For the Love of Humanity, of a global network of anti-war activists with a diverse range of political priorities and commitments.” I would like to begin with this diversity, and what appears to be Krever’s frustration, if I can characterize it this way, with it. While I offer my response to this question in the last chapter of the book, arguing that “law’s empire” is not an alternative to, but an articulation of, “empire’s law,” it would be incorrect to claim that WTI activists ever reached consensus over this question. Nevertheless, it is perplexing that Krever concludes his reflections with the claim that in my account of the WTI, “imperialism is mentioned in passing, capitalism not at all,” which reflects he says, “perhaps less Çubukçu’s disinterest than the political confusion of a diverse network of activists. For all Sartre’s preoccupation with legality, he was at least clearsighted about the engine behind the U.S. war machine: ‘capitalist imperialism.’” As difficult or easy as Sartre, the vanguard of the Russell Tribunal, may have found it to agree with himself (or Russell) when attempting to square his invocation of law and legality with an analysis based on capitalist imperialism, the collective negotiation of that conundrum (and more) by the decentralized, horizontal network of WTI organizers around the world was not the result of the “political confusion” of a diverse group of activists but the product, as I demonstrate in the book, of their political determination to work through that diversity. Hopgood refers to the intermezzo of my book, “Can the Network Speak?” as a “testament to the political weakness of network forms of action based on disparate interests and positions.” While I certainly explore weaknesses of the network form and consensus model of decision-making in the praxis of the WTI, that is not all I do in the book. I highlight as well the advantages and potentials of this particular form of organization, which was perhaps the major point of consensus—even pride—among WTI organizers, even when they found it “excruciating” in practice. But also, in the intermezzo and more, I demonstrate how political disagreements among WTI activists were displaced onto organizational disputes, especially when affective bonds among them, most importantly trust, were in fact hurt. Wilder further summons that the WTI acted “as a global political subject for a planetary politics whose framework, language, and institutional arrangements do not yet exist (and perhaps can never fully exist).” While this may be true, when enacting its planetary politics of anti-imperialism and internationalist solidarity in the present, the WTI found(ed) itself speaking through existing languages of liberal cosmopolitanism in a context where supporters of the war on Iraq mobilized elements of this cosmopolitanism—including arguments for global responsibility and care, international law, and human rights everywhere—when making their case for the “liberation” of Iraq by the United States and its allies. This predicament, this consequential coincidence raises the problem of distinguishing “anti-imperial internationalism from cosmopolitan imperialism” (in Wilder’s phrasing), which I address throughout the book. But the book’s “overriding concern” is not challenging liberal cosmopolitanism, human rights, and humanitarian intervention as Wilder suggests. As Allen recognizes, the analysis I advance “moves beyond the critique of powerful governments to consider when anyone, like the cosmopolitan citizens of the World Tribunal, can act on behalf of people they saw being wronged.” The issue here is, in Allen’s précis, the imperial pitfalls “of doing good for others ‘in the name of humanity’ generally, by anyone,” including by NGOs such as Amnesty International and Human Rights Watch (whose approach to the war I critique in the book) and by WTI activists—even when the latter did not, as Wilder correctly observes, “simply act in the name of humanity,” or for that matter, in the name of the Iraqi people as such. WTI activists were aware that both “humanity” and “the Iraqi people” were divided, to put it starkly, into pro-war and anti-war camps (and more). While observing how the distinction between transnational solidarity and foreign intervention “carries within itself an implicit recognition of national sovereignty,” Alessandrini appears more prepared to let go of “national sovereignty” (or self-determination, or what I prefer to think of as “autonomy”) than many WTI activists were at the time, including myself, in imagining the demands of a “fully internationalist vision of solidarity” that was, at once, anti-imperialist. In principle, to my mind at least, respect for the autonomy of the multitude called “the people of Iraq” did not demand supporting Saddam Hussein or all actions of “the Iraqi resistance.” But it did require thinking alongside people who did and did not do so, while recognizing Iraqis, in all their diversity, to be the proper subject of politics within their country—and even beyond, in one World Tribunal on Iraq. However, had we, as WTI activists, been able “to imagine the WTI itself as a non-violent intervention in the form of international solidarity,” as Alessandrini invites us to do, perhaps then we might have been in a better position to take responsibility for that intervention and its risks—including imperial and paternalist pitfalls—which I attempted to explore in the book. In Allen’s perceptive words, WTI activists “grappled with rethinking the meaning of sovereignty, intervention, and rights beyond a state-centric, top-down framework of political action.” This was no easy task, certainly not one for the faint-hearted. As WTI activists attempted to think beyond these liberal political forms, they faced myriad difficulties and dilemmas, many of which they could not resolve. However, I hope with Wilder that For the Love of Humanity offers, along with the World Tribunal on Iraq’s experimental praxis, “the remarkable example of how such a heterogenous and international network of groups actually managed to work across so many incommensurable differences to create such a powerful and beautiful medium through which to intervene directly and performatively on the stage of world politics.” When all is said and done, there are more or less beautiful ways to lose. Ayça Çubukçu is Associate Professor in Human Rights and Co-Director of LSE Human Rights at the London School of Economics and Political Science.